Host Hub Review 2019: Is Host Hub a Good Hosting? Host Hub is a small web hosting provider based in Bangladesh but with data centers in the United States. This vendor offers shared web hosting, VPS hosting, reseller hosting, and domain name registration to businesses of all kinds in Bangladesh, the U.S., and other countries including Russia. 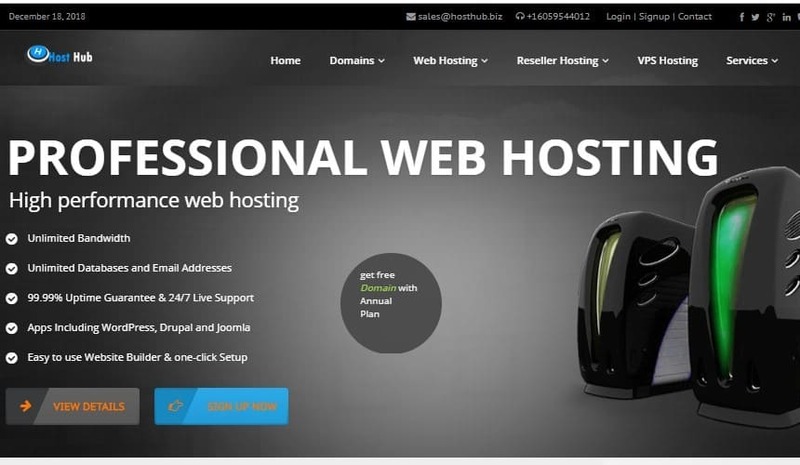 Host Hub is a small web hosting vendor with headquarters in Rangpur, Dhaka, Bangladesh. With data centers located in the United States, it has a significant customer base in this country as well as in its home country of Bangladesh and in Russia. The offered hosting solutions include shared web hosting, virtual servers, dedicated servers, and reseller hosting. Host Hub offers unmanaged hosting running on both Linux and Windows operating systems. They insist that to ensure consistently fast loading and no overloading, they don’t oversell their servers. Host Hub’s VPS plans include dedicated RAM, dedicated IP, a monthly bandwidth of between 500GB and 1000GB (based on your preferred plan) and full root access to your server. They also offer cheap reseller hosting solutions with powerful RAID-protected dedicated servers. The reseller package includes free reseller domain panel, WHMCS billing software, private name server, white label hostname, and an IP unblock option. Finally, Host Hub performs daily and weekly backups to ensure your website data is always safe and can easily be retrieved in the event of data loss. Host Hub’s hosting plans are quite cheap in comparison to what other vendors are offering, especially considering the included features. This vendor offers two billing cycles: annual or monthly. In addition, they offer a free domain and often give new customers highly discounted introductory prices. They have a 30-day trial period within which you can get a refund if you’re not entirely satisfied, and they provide a 99.9% uptime network guarantee. You can get in touch with Host Hub’s 24/7 support team via email, telephone, ticketing system, but sadly not live chat. You can be assured of rapid responses from polite expert staff, and you can support yourself (to some extent) using their small knowledge base. While Host Hub’s hosting solutions appear to be quite reliable and high quality, the vendor does not give too much detailed information about the included features. But their cheap prices coupled with an excellent support team make this hosting provider a popular choice for many individuals and smaller businesses in Bangladesh and beyond. Wondering how Host Hub stacks up against other Web Hosting companies? Enter any other Web Hosting company and we will give you a side-by-side comparison.